The hot mineral water pools and day spa in Yverdon-les-Bains are worth the short drive from Lake Geneva to the southern shores of Lac de Neuchâtel in Switzerland. The Centre Thermal in Yverdon-les-Bains is a large mineral baths complex with day spa and fitness facilities. Three large pools welcome visitors with hot mineral-rich water, Jacuzzis, bubble baths, and jet streams. Spa wellness and beauty treatments are optional, as is a large gym. Yverdon-les-Bains is located on the southern shores of Lake Neuchatel only half an hour’s drive from Lausanne and Lake Geneva. The Romans already enjoyed the hot water sources of Yverdon-les-Bains and since the Middle Ages the mineral rich waters were considered to have health benefits. Nowadays, most visitors simply come to relax in the warm water pools but health, wellness, and beauty spa treatments are also available. The main attraction of the Centre Thermal in Yverdon is the three large hot water pools. The indoor pool and one of the outdoor pools are at 34°C while the water of the second large outdoor pool is a still comfortable 28°C (31°C in winter). The pools have a variety of water features such as Jacuzzis, bubbles, jet streams, and waterfalls to help massage muscle pain away. The pools at Yverdon-les-Bains are fed by a source discovered in 1982. Around 60 liters per second bubble to the surface at a temperature of 29°C. The water has high concentrations of various minerals including calcium, magnesium, sodium, potassium, and sulfates. 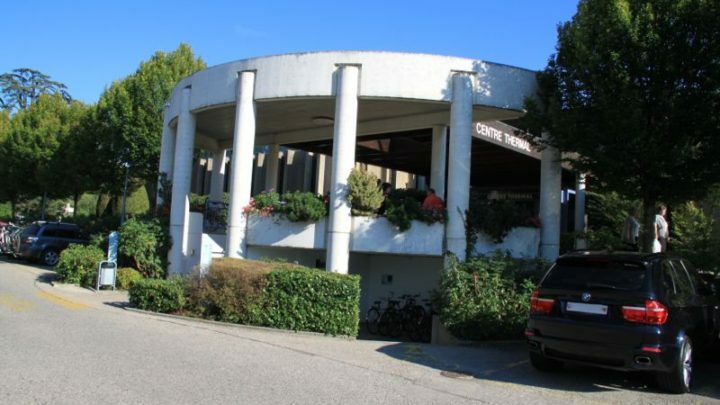 In addition to the warm pools, the Centre Thermal in Yverdon-les-Bains features all the day spa and wellness facilities common at thermal bath complexes in Switzerland. These include amongst others massages, beauty treatments, saunas, and steam baths (Hammam). The Centre Thermal also has a large gym with fitness training classes. Medical treatments are also available especially for recovery from sport injuries and rheumatism. A small cafeteria offers snacks and small meals. Picnicking (and smoking) is only allowed in a small, dedicated area outside behind the pools. The Centre Thermal in Yverdon-les-Bains has long opening hours and is only closed on December 25. The pool complex is open daily from 8 am to 10 pm (8 pm on Sunday and public holidays). Admission to the pool complex is for three hours and is CHF19 for adults and CHF11.50 for children 3 to 16. Children under 3 are not allowed in the complex. Families (at least one adult and child) receive 10% discount. The fitness and wellness areas are for adults only and require an additional charge of CHF11 each, or CHF35 for the pools, fitness and wellness centers. Getting to the hot water spa in Yverdon-les-Bains is easy by car or public transportation. Yverdon-les-Bains is on the southern tip of Lake Neuchatel with excellent highway and fast inter-city train connections to the rest of Switzerland. The Centre Thermal is in the southern suburbs of Yverdon very close to the Yverdon South exit of the autoroute A1. Driving times from Lausanne is around 30 minutes while Geneva Airport is only an hour’s drive away. Ample free parking is available directly at the spa. From Yverdon train station, bus 604 takes only around 5 minutes to stop Centre Thermal. Alternatively, it is an around 1.5-km walk. Yverdon-les-Bains is an interesting city to visit. It was once an important Roman center and its chateau houses an interesting local history museum (don’t miss the Roman barges in the basement). Also worth visiting is Chateau de Grandson, Switzerland’s second largest castle, located just to the north of Yverdon on the shores of Lake Neuchatel. See also Top Hot Water Resorts and Day Spas for more on other thermal baths in the Lake Geneva region.